Join us at Zhou Zhou Bar for our next Japanese Whisky tasting with Nikka Whisky, hosted by Nikka brand ambassador Kevin Griffin! Nikka Whisky is one of the most successful Japanese whisky companies with 2 contrasting distilleries ‘Yoichi’, and ‘Miyagikyo’, and a rich history behind its founder Masataka Taketsuru. 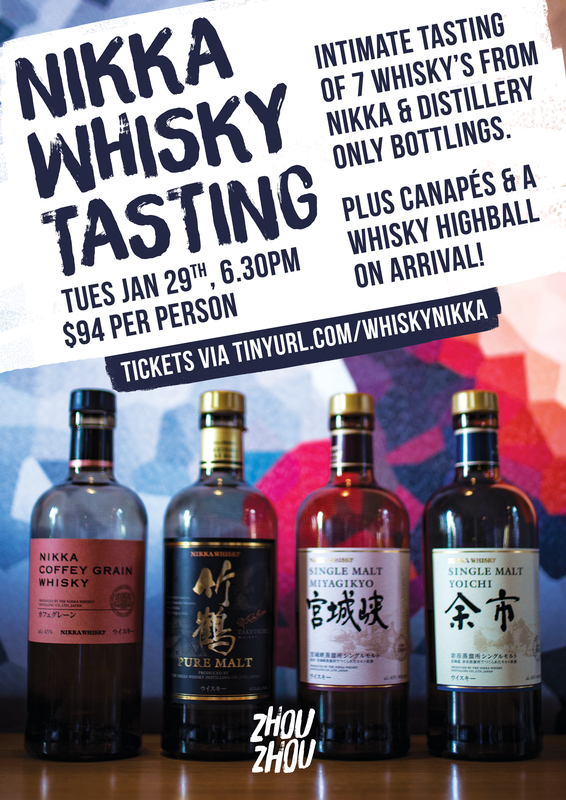 We’ll kick things off with a Nikka Whisky Highball & canapés from the Oriental Teahouse kitchen, before sitting down and tasting through 7 different whisky’s from Nikka’s superb line up. We are also lucky enough to be opening up 2 cask strength distillery-only bottlings for this event, that are very rarely ever seen in Australia. Due to these bottles the tickets are strictly limited, this is a night not to be missed!